Edoardo Piermattei (b. 1992) in the Marche, a region which represented the artistic heart of Italy during the Renaissance, had always been fascinated by the imposing ancient architectural structures and by the richness of the color palette in their interior and exterior decorations, therefore he focalized his work on a modern and lively reproduction of those admired features. 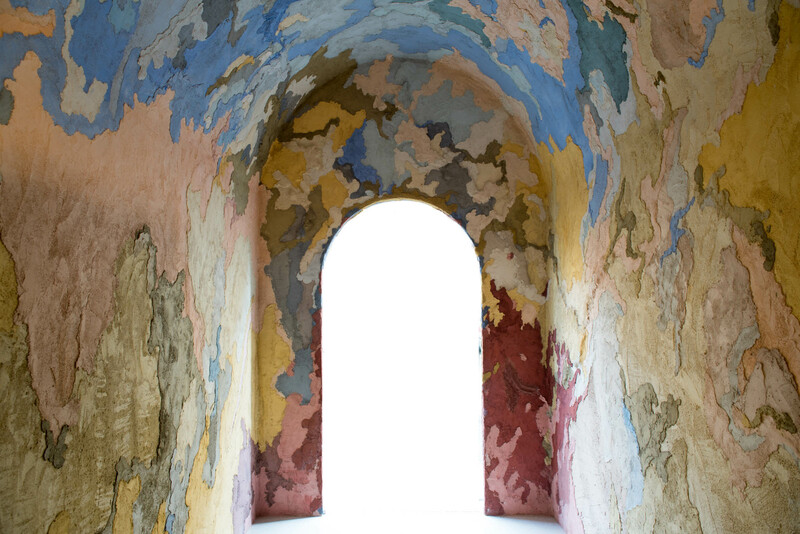 To decorate his architectural structures, Piermattei used the ancient fresco technique consisting of powders and pigments bonded with glue and concrete. This colorful aspect is firstly a tribute to the great Italian masters, and it immediately recalls the decorative cycle of Assisi painted by Giotto and Cimabue, not to mention the giant, graceful and light-colored clouds which dominate the ceilings of Giambattista Tiepolo. The idea behind his work is the need to restore Art’s primary position as a determinate and invasive element, both in private and social environments. Such role is essentially the opposite of what happened during the last century, when Art was confined into the mere frame of bourgeoisie’s villas white walls. The Italian young artist has already participated at several group shows, among all: Codice Italia academy, Palazzo Grimani, (Venice) in 2015 and HxBxP, le accademie si mostrano, mostra delle accademie italiane, (L'Aquila) in 2016. Piermattei’s solo exhibitions include Porziuncola at Art Basel Hong Kong in 2017, a solo show at Spazio Buonasera, Turin in 2016, and a solo show at Vilhena Palace, Malta in 2015. Edoardo Piermattei lives and works in Turin, Italy.